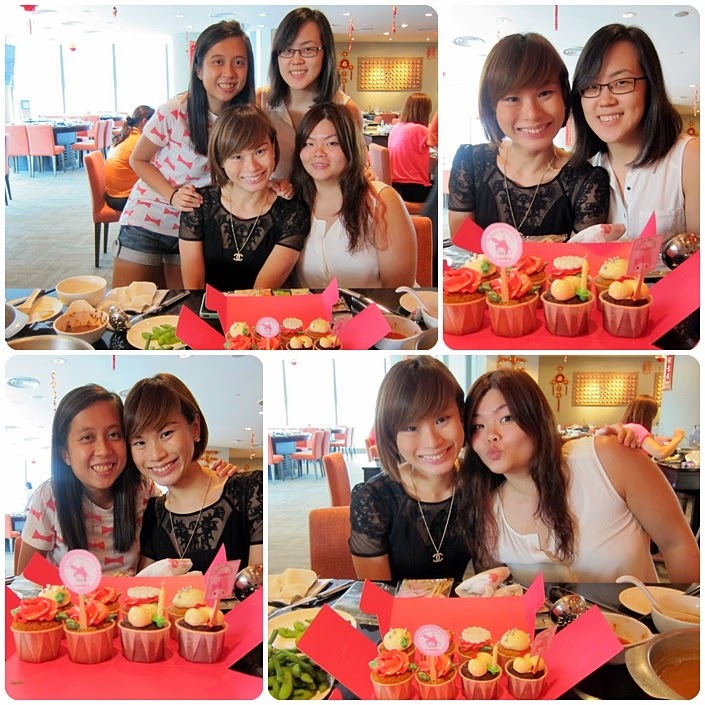 Birthday celebration with my favourite girls 2 days before my holiday to Korea :) It was a simple one; which was what I requested. Told them not to overspend unnecessarily or fret on how to give me a surprise. Never tried Jpot before & I thought the food there was appetizing & fresh. Not forgetting the free-flow of drinks (home-made barley & luo han guo) which were equivalently up-to-standard. No diluted drinks okay; both very flavorful!!!! Spot the fried tau-kee on the top left. I LOVE TAU-KEE (beancurd skin) !!!!!! Cupcakes are from De**ert Cup; which I highly highly NOT RECOMMEND!!! Pls mark my words – NOT RECOMMENDED!!! But why I'm so agitated is becos there was one Valentine's (2yrs back), Sam bought a big cupcake from Dess*** Cup as well. Below is the picture of the cupcake he bought. And guess what, this cupcake cost him a whopping $18!!!! Just a "i ♥ you" on a way-below average cupcake inside a plastic container cost $18. But honestly, their cupcakes are dry, & flavorless, and the cream used is so oily & flat. Basically the cuppies are can see but CANNOT CONSUME type. I thought that Valentine’s will be my first & last time trying the cuppies; but even given a second chance, my verdict remains UNCHANGED. Some photo-taking time with the cuppies & me. 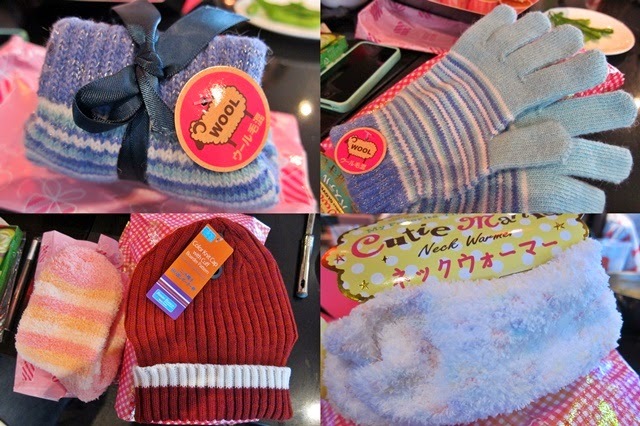 Look at the winter products they have gotten from Daiso for my Korea trip. All useful and affordable. Especially love the neck-warmer (which is really handy instead of twirling the scarf around the neck), ear muffs (so happy when I see this cos this is the only item I lack for my winter trip) and feet warmer (even though there is a hole :p and very loose - the sock will somehow be separated from my feet during my sleep). As well as 3 charms to add on to my Pandora story; of which one of the suitcase (below left) I have changed it to a White Fizzle glass charm. Sam joined us thereafter & we had a chat at Starbucks before dinner at Sushi Teh. Unexpectedly, the girls surprise me with a heart-shaped birthday cake (Yupz, it was from D**sert Cup as well). Third time trying & I can confirm + guarantee + assure you my verdict on them!! Have not tried flying it, but the material used to make the kite is of top quality; should be able to fly cos I happen to know that the initial plan for my birthday celebration is to picnic at Marina Barrage (but becos due to some issues arising, it was cancelled). 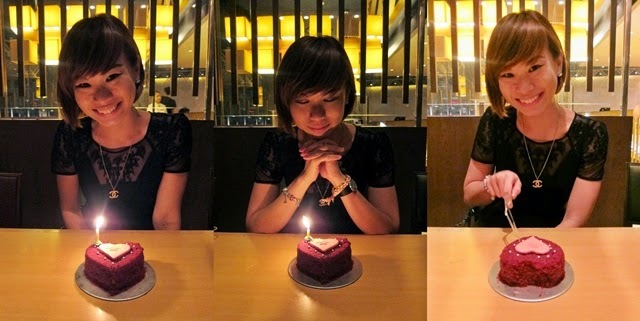 Darlin, Agnes & Jiahui: Thank You for the yearly birthday celebration for me. They surely know what to get for me despite me coming out with my birthday wish list late. 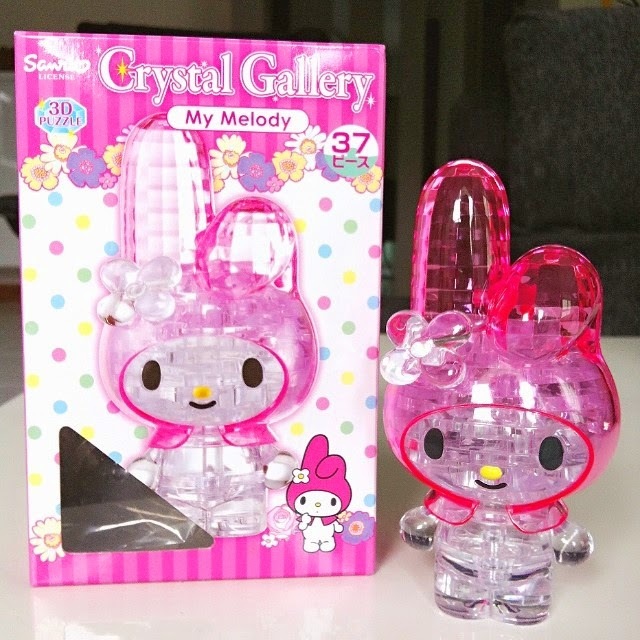 And my My Melody 3D puzzle. 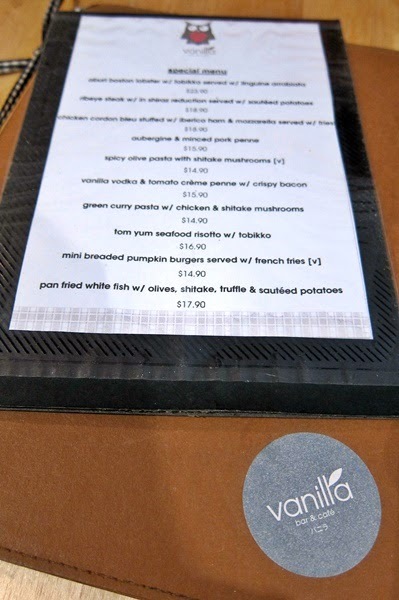 A very belated birthday meal with Jessica at Vanilla Cafe. 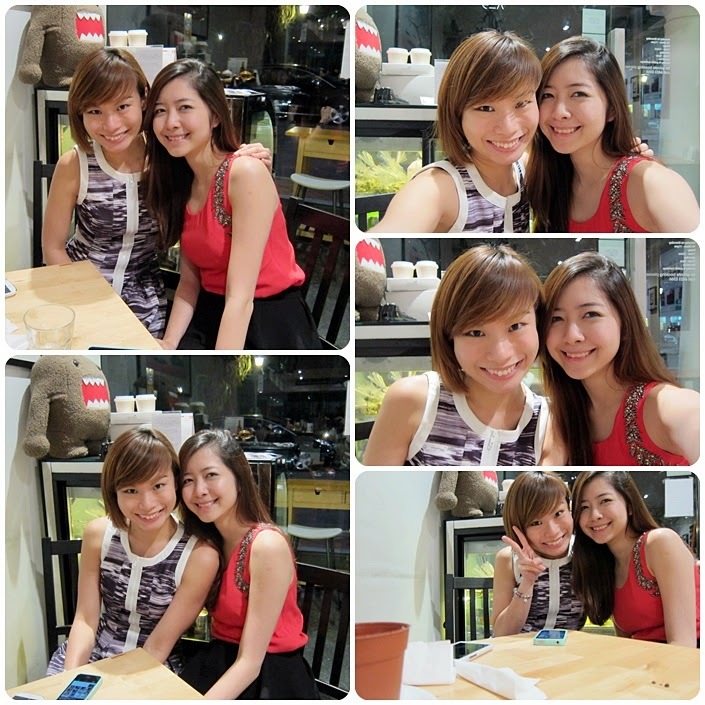 Was supposed to meet her earlier but she was sick…hence we postponed till last Thursday. My second time trying Vanilla and the first was like yearsss ago (for an ex-colleague’s hen’s night). After placing our order, Jess was so eager to pass me my birthday present; unwrapped. HAHAHAHAAH!! I came to know about this product from blogs but I thought this SD card requires a Wi-Fi camera to work hand-in-hand with (Ok, I did not read the content of the blogs carefully :S). Never did I expect the FlashAir is able to function on my “vintage S95”. 1) Load the FlashAir SD Card into your camera. 2) Download the FlashAir app on your mobile. 3) Start taking pictures with your camera. Snap snap snap! 4) Switch on wi-fi settings on your mobile. 5) Look out for the network “flashair_xxxxxxxx”. Connect with the given password provided in the instruction leaflet. 6) With your camera still on and wi-fi connected on your mobile, load the FlashAir app. The photos taken on your camera will automatically be transferred to the FlashAir app (on your mobile). From the FlashAir app, you can then proceed to save the photos into your mobile gallery. With this card, I can upload high-quality images to my mobile (and share it with my friends/on FB/Instagram) instantly. This new product is create just for people like ME – Instagram addict!!!!! Now I know why Jess is so excited to pass me my birthday gift already!! Back to the food reviews. My Tom Yum Seafood Risotto was not bad. Tom Yum taste is not overly strong (to my liking); just that the risotto was a little too dry. Prawn was fresh too. 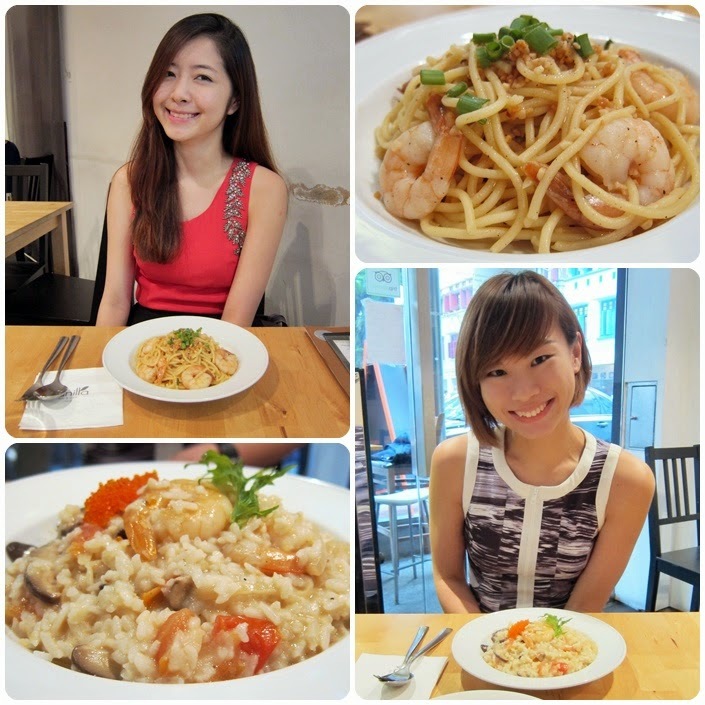 Jess’s Garlic Prawn Pasta was MEH. Nothing special; spaghetti was dry (as you can see from the pic) as well and it tasted “garlic only”. No prawn taste at all. And where got spaghetti put spring onion one?? Hello...we didn't order bak chor dry yellow mee lehs. Tssssskkkk. SPAM Fries – which was CRAP! DOES THIS LOOK LIKE FRIESSSSSSS TO START OFF????? Well, their Vanilla Dirt Cake, which is one of their signatures, is delectable though. We loved this!! They present this dessert in a form of plant pot, with oreo as the soil and gummy worms as the brown worms. Flower stalk is not edible. This is how it looks underneath the “soil”. I guess this should be a mixture of cheese cream, butter & oreo cream? Whatever the ingredients, the texture is very smooth & tasty. Stay tuned to my 8D7N Korea #SCtravelogue up next.